The patent-pending Hand-Tight EXP® Trap Column is rated for use at 20,000+ psi (1,400+ bar). This unique design connects directly to any injection valve (with 10-32 threads) or in-line with 1/16” stainless tubing for unparalleled convenience and efficiency. The EXP® Cartridge System enables chemists to quickly remove detergents or salts which can affect the ionization process in MS work. This trapping technique can concentrate the sample directly on-line, allowing for increased recovery of precious sample material compared to off-line techniques. On-line trapping readily lends itself to automation for high-throughput analysis in UHPLC/MS applications. Free-Turn® architecture allows the user to change cartridges by hand without breaking fluid connections on the holder inlet/outlet. The recently expanded EXP® Trap Column family now offers packed beds available in 2, 5, 10, 15, 20 and 30mm lengths with diameters ranging from 1-4.6mm. At this time, please contact us directly if you're interested in a length other than 5mm. Hand-tight trap replacement - NO TOOLS! 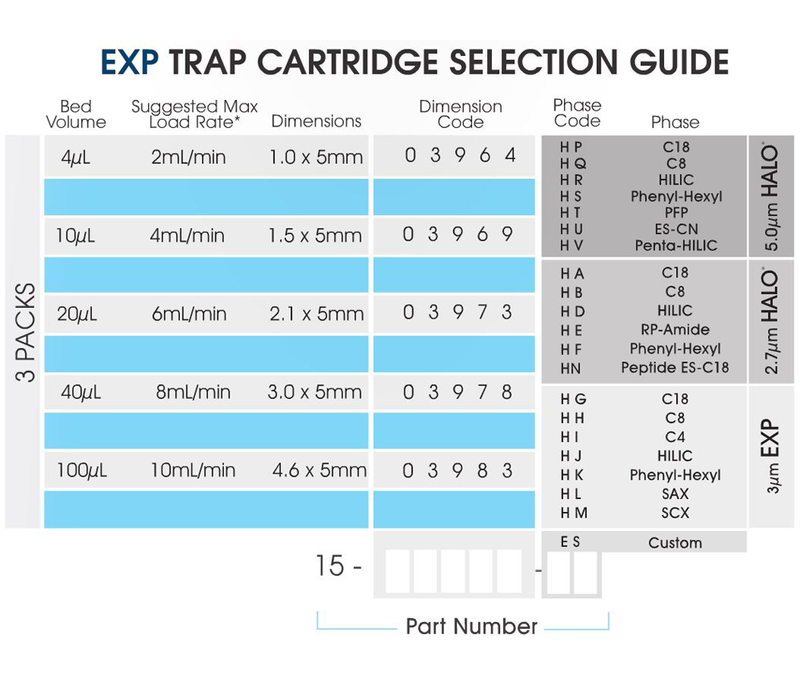 Click the button below to add the EXP® Trap Column Cartridges to your wish list.